Did you know Solar Panels from Eco Horizon will generate more power than you actually require on certain days, this is where the Battery Storage System comes into play, a typical Solar Power System will generate 30-40% of your household or business needs, with a Battery Storage System you can have the potential to generate up to 100% of your required electricity using Solar Power. MyReserve Battery Storage Solution provides you with solar energy from your photovoltaic system even when the sun is not shining ensuring that none of that valuable solar power goes to waste. MyReserve was built from the beginning as the most intelligent system available. It ensures the highest amount of power saved is available as usable energy. 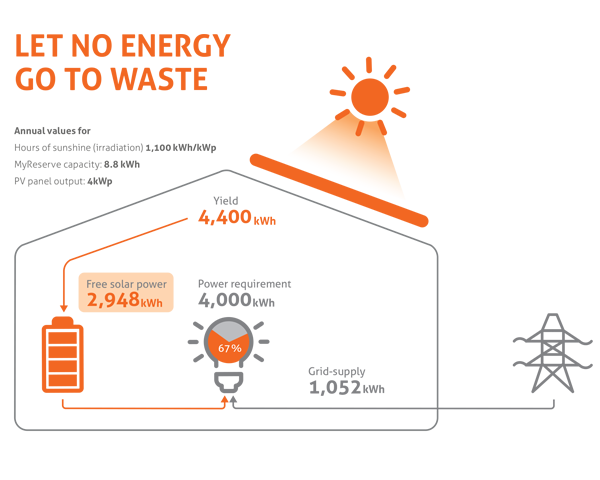 The configuration shows 67% of an average household’s annual requirement being met with privately produced solar power. Subsequently larger configurations can raise that percentage to 80%. You can now declare your energy independence and meet your family’s needs with absolutely free solar power. 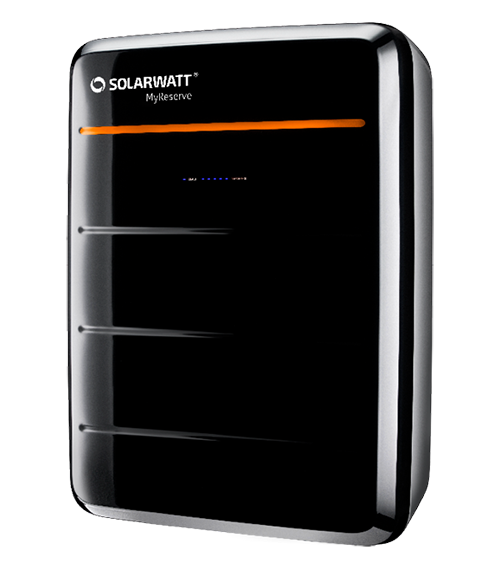 SOLARWATT’s MyReserve 500 offers you the most economical lithium-ion battery in the world. It is particularly well suitable for new PV systems which are dimensioned. MyReserve 500 is optimized for photovoltaic systems with 10 to 13 panels. MyReserve leads the competition and only consumes between 5 and 15 watts. In standby mode it’s electricity consumption is even less than 5 watts. MyReserve offers a superior battery efficiency level of 99.2%. System efficiency level is 96 % at best point and 93% in full cycle. MyReserve registers the demand for electricity in the home immediately and supplies the stored energy within less than a second. As a result of the extremely effi cient electrical conversion, MyReserve converts virtually no energy into heat. Therefore battery cooling is not required. The MyReserve battery management system is monitoring all system parameters at once. With its intelligent charging and discharging algorithms it ensures the highest safety and maximises its system lifespan. MyReserve is equipped with self-learning software to forecast weather and independently develops an optimal operating strategy to maximise personal consumption whilst at the same time minimising battery ageing.